There is a synchronistic connection, vis-a-vis the Time/Distance Correlation, between the themes mentioned in the title to this post, namely 2012, America, the Prime Meridian, and the Temple Mount. 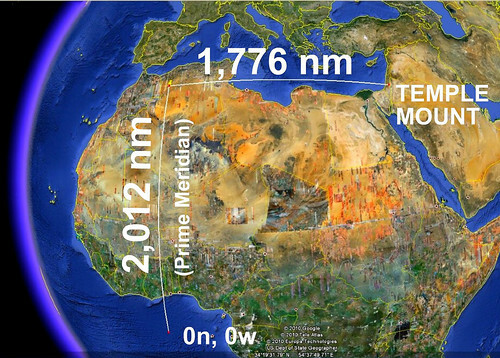 If you measure 2012 nautical miles north on the Prime Meridian from the equator, you reach a point that is 1776 nautical miles from the Temple Mount. I don't know if anybody else has found this already, but I nearly hit the floor when I found it.